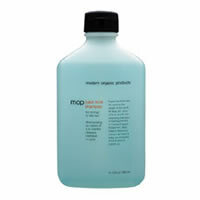 MOP Basil Mint Shampoo is a refreshing tonic for normal and oily hair. MOP Basil Mint Shampoo lifts oily hair that feels like it's carrying the weight of the world, full of lift dirt, pollutants and oil. This is a deep cleansing shampoo containing extracts of certified organic peppermint, basil, sage and rosemary, to give hair a natural lift and supercharge to leave hair fresh and lively, full of healthy shine and movement.